Cambrian Heritage Railways (Llynclys) Steam RailwayOswestry was a railway town from the 1860’s until passenger services ended in 1966, though quarry trains ran until 1988. Oswestry Station was the headquarters of the Cambrian Railways – a group that ran over 300 miles of track from Wrexham to Whitchurch in the east, to Aberystwyth and Pwllheli in the west and Brecon to the south. The town had two stations - the Cambrian Railways station (which still stands on Oswald Rd) and the GWR station (now Morrison’s car park). 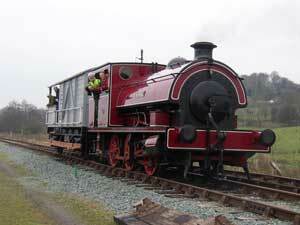 The Cambrian Heritage Railways operate a 1200 metre section of line from a replica, period station at Llynclys South, to Pen-y-Garreg Lane, Pant; the station has a number of sidings with rolling stock stored here. All passenger trains are heritage diesel multiple units. This section of the line is 5 miles south of Oswestry - see also Cambrian Heritage Railways at Oswestry. Oswestry was a railway town from the 1860’s until passenger services ended in 1966, though quarry trains ran until 1988. Oswestry Station was the headquarters of the Cambrian Railways – a group that ran over 300 miles of track from Wrexham to Whitchurch in the east, to Aberystwyth and Pwllheli in the west and Brecon to the south. The town had two stations - the Cambrian Railways station (which still stands on Oswald Rd) and the GWR station (now Morrison’s car park). Trains run every half hour from 11:00 to 16:00. Adult £5.00, Seniors £4.00, Child under 18 £3.00, Family (2 + 2) £12.00. Combined fares for both Llynclys & Oswestry: Adult £8.00, Seniors £6.00, Child under 18 £5.00, Family (2 + 2) £20.00. Llynclys South Station is just off the A483, 5 miles south of Oswestry. Join the B4396 at Llynclys crossroads and head towards Knockin.